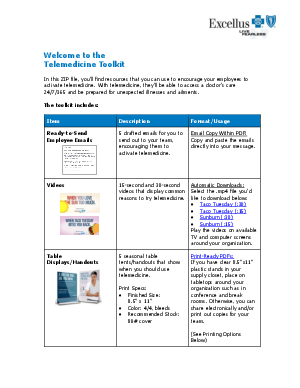 > Excellus BlueCross BlueShield > Help get your employees on board with telemedicine with this easy-to-use toolkit. According to one analysis from Towers Watson, telemedicine has the potential to save U.S. companies more than $6 billion a year. The catch? Employees need to use it. Together, we can overcome the behavior change challenge created by a lifetime of trips to the doctor’s office. This toolkit positions telemedicine as a great alternative available to employees 24/7/365, showing them when, why, and how to take advantage of the service. It includes posters, pop-up banners, table displays, videos, mirror clings, and ready-to-send emails. Note: The toolkit is delivered as a single PDF containing an intro document and the ready-to-send emails with links to the other pieces. Copyright © 2018, Excellus BlueCross BlueShield, a nonprofit independent licensee of the Blue Cross Blue Shield Association. All rights reserved.